I like the simplicity of the cover illustration. I'm already drawn in. Sounds like a lovely book. Looks like a sweet book. Thanks for sharing! Something is going on with my connections, Carol. I already commented but it does not show up. Thanks for showcasing the poem about winter. It is delightful. Consider sending me an image poem for my winter gallery. 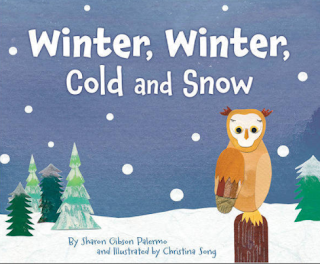 This looks like a lovely picture book for story time - we don't typically get that kind of winter here, though this year we got slammed with a strange and unusual white winter! What a sweet way to get kids involved in rhythm and beat and season. I teach older kids....and the importance of background information from their early years cannot be underestimated! We so need kids to have poems like this in the back pockets of their minds. When they get to be young teens they simply put the brakes on adding them then. Have a great week and thanks for the super share! Yes, it does have that Brown Bear feeling to it. This looks like a wonderful book! That sounds like a book young ones would want to hear over and over. Yes to getting them hooked on poetry early! Such a sweet book, Carol...and I am in need of sweet books! It looks like it has the right word in the perfect sequence. Love this line from your post: " I want books that will make their way into their mouths, and into their hearts, . . . " I'm requesting this book now because I also love poetic picture books. Enchanting little book; short, sweet and nature/critter focused, thanks for sharing it with us! I am looking for this book!